There are plenty of beautiful NYC parks in the city, but this is the first (and the only) one that floats! You might be familiar with this mammoth-size farm created by the innovative organizers from Swale. 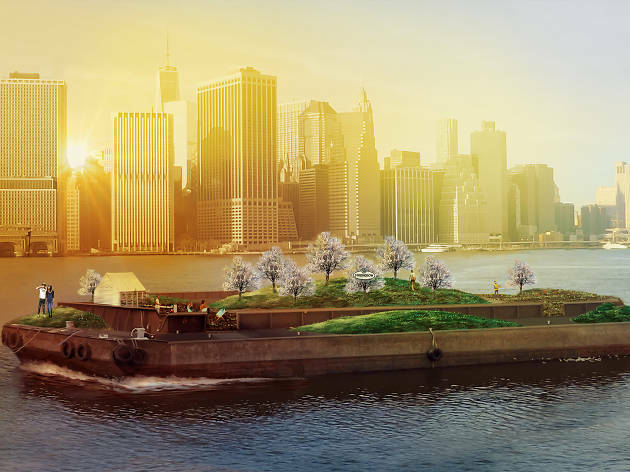 The company, which launched the “floating food forest” last June, allows visitors to discover the joys of sustainable living while nabbing fresh—and free—produce, while totally avoiding the dirty work. In the past, the park contained perennial plants (herbs, asparagus, swiss chard, fruit trees with persimmons), which grew on the 80-foot-long barge (a wetland structure) using filtered water from the New York Harbor. 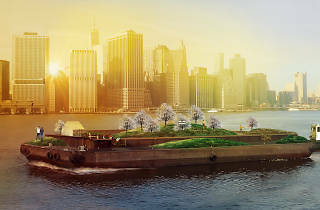 Now, with an updated look in collaboration with Strongbow, the duo will transform the barge into a floating apple orchard and perennial garden oasis to set sail on the waters surrounding Manhattan next month through fall. wheres the list of locations? upcoming locations and dates below ? @John L @Rob L Sorry, I think that's last years. Any info about THIS years?